(Left to right) Professors Cathy Cohen, Elisabeth Clemens, Adam Green, Faith Hillis, Joseph Masco, Casey Mulligan, and Robert Pape present their take on Trump on January 19th at Mandel Hall. Faculty met Wednesday and Thursday at the School of Social Service Administration (SSA) to consider the policy impact of the imminent Trump presidency and the circumstances that led to Trump’s election. The Wednesday panel, “Inaugural Implications: For Policy, Politics, and Social Work,” featured SSA professors Angela Garcia, Harold Pollack, Julie Henley, and William Sites. Speaking at the Thursday panel, “#Talkingtrump: Conversation, Context, Controversy,” were Professors Lis Clemens, Adam Greene, Faith Hillis, Joseph Masco, Casey Mulligan, and Robert Pape and organizer Paul Poast. At “Inaugural Implications,” Garcia discussed what she considers the five main changes to programs and policies that will be made under the Trump administration, including a harsher deportation process, border security, interior enforcement, an attack on the Deferred Action for Childhood Arrivals (DACA) program, and the Muslim ban proposed by President-elect Trump during his campaign. Garcia emphasized the uncertainty that she believes will accompany the upcoming administration. “There’s a lot to say...and I’m going to talk about five likely things that may happen under the Trump administration, but this is all just guesswork based on statements that Trump and his associates have made on the campaign trail and post-election, so this may or may not come to see the light of day,” she said. Pollack followed with commentary on health policy. A strong supporter of the Affordable Care Act, Pollack emphasized that its repeal amounts to a huge tax cut for the wealthy. “It’s sort of an odd moment, because the Affordable Care Act has never been more popular, and among both Trump and Clinton voters, an awful lot of people are very nervous about what will happen to this law and to their loved ones,” Pollack said. “Democrats should proceed with confidence, because the American people are on their side. The polls are not wrong, just not determinant in the political process.” Pollack has announced plans to pursue civil disobedience in opposition to Trump policies. Concluding the panel were Henley and Sites, who discussed working-family policy and class and race in U.S. politics, and the possibility of a creation of an anti-Trump coalition. “By talking about class and race, I’m not trying to dismiss or suggest that other dimensions of the Trump victory are unimportant. Nevertheless, I want to suggest the potential of a broader opposition to Trump that we can expect to emerge, including substantial sectors in the political and intelligence community. Things are very much in flux now politically. In the meantime, I want to put out there certain class and racial dynamics that I think are revealed by the election,” Sites said. 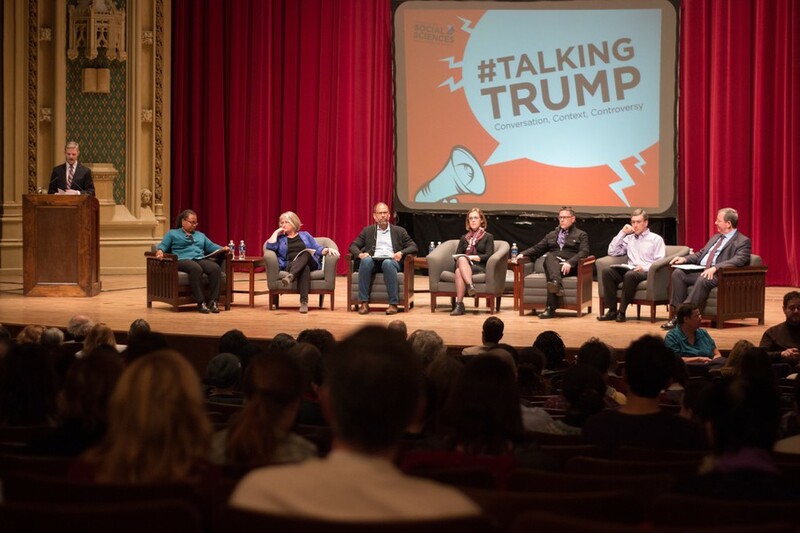 In Thursday's “#Talkingtrump” panel, seven Social Science Division professors participated in a round-table discussion, moderated by political science professor Cathy Cohen, about the controversial conditions under which Trump was elected. The event concluded with questions from the audience. 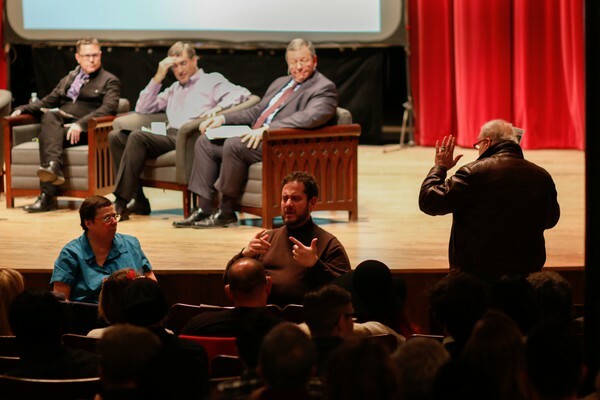 The speakers reminisced about the accomplishments of the Obama administration, and posed questions concerning the changes that might be made in the next four years under Trump. “This is the last full day of President Obama’s administration. What is mind-boggling to me at this moment is that our first African-American president is handing over the laws of power to a person who has practiced rhetoric in racism,” Cohen said. At one point during the panel, a protester interrupted to point out that the speakers “may be the know-it-alls of the topic, but people in the audience have things to say.” Cohen responded that while she appreciated his comments, she wanted to allow the attendees who followed the Q&A protocol to ask their questions, and the protester sat down. An audience member interrupts the panel discussion. After being chided by the moderator, he sits down. Hillis concluded by offering suggestions for how the American people should go about tomorrow’s inauguration.“Under these unprecedented events, I do want to end on a more hopeful note. The most important thing moving forward as of tonight is that we must not comply. If you’re feeling outraged tonight, stay outraged,” Hillis said.